Kirt loves his 8-0 Kingfish so much that he ordered a second just like it…well, almost. Same eps/epoxy with S-glass lamination. We tweaked the tail rocker a bit and changed the colors (but not the pattern). 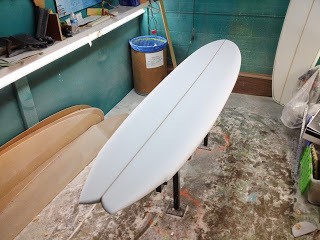 Board replication is where computer-based shaping really shines. Kirt’s original Kingfish was hand-shaped, so I had to spend a couple of hours “blueprinting” it. Duplicating the rails is the most difficult, and then comes rocker. It only takes a few minutes to tweak a board file, and once done, it can be used to cut one or a hundred duplicates.